Gov. David Ige used his fourth State of the State speech to request an additional $100 million from state lawmakers for housing, and says the state is “on track” to build 10,000 new housing units by 2020. Star-Advertiser. Ige touts accomplishments, ignores missile alert in State of the State address. Gov. David Ige touted accomplishments from his first three years in office in his State of the State address on Monday, including boosting pay for teachers and outfitting more classrooms with air conditioning, and vowed to keep tackling the state’s housing shortage. Associated Press. In rebuttal to critics, Ige uses State of the State to highlight his wins. Hawaii News Now. Governor delivers State of the State address for 2018. KHON2. Education also ranked high on the governor's list in his State of the State speech. KITV. Governor David Ige’s State of the State address covered what his administration has accomplished and what it’s going to do to help ease homelessness, build more affordable housing, educate keiki, protect the environment and invest in highways. Hawaii Public Radio. 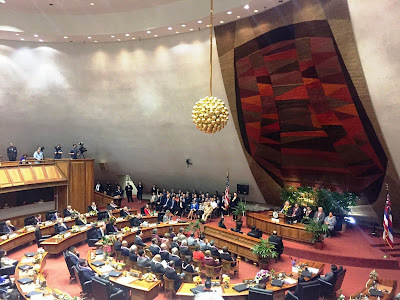 Education, innovation, and affordable housing were some of the main ideas found in Governor David Ige’s January 22 State-of-the-State address. The false missile alert that has consumed much of his time since January 13 was not mentioned. Big Island Video News. Why no discussion of bogus ICBM alert in State of the State? Ige says he's talked about it enough. Hawaii News Now. Media Isn’t Ready To Let Ige Put Missile Alert Behind Him. The governor wanted to talk about issues and accomplishments. Reporters were waiting with questions about the false alarm. Civil Beat. Lawmakers: Ige speech lacks details. Affordable housing, creating quality jobs, education and traffic were top priorities Gov. David Ige spoke of during his State of the State address Monday from the State Capitol in Honolulu. Garden Island. Full text: Gov. David Ige's 2018 State of the State address. All Hawaii News. Hawaii Minority Caucus responds to Ige's address. KITV. HI-EMA executive officer Clairmont retiring this year. Toby Clairmont, the executive officer for the Hawaii Emergency Management Agency, is retiring by year’s end. Star-Advertiser. False-missile probe to get ‘fresh pair of eyes,’ Ige says. Gov. David Ige on Monday defended his selection of the state’s deputy adjutant general to lead a probe of last week’s false missile alert and make recommendations for improvements, despite criticism from some lawmakers who contend the official is too close to the situation. Star-Advertiser. Gov. David Ige told reporters Monday that part of the delay in notifying the public that the Jan. 13 ballistic missile alert was a false alarm was that he did not know his Twitter account password. Star-Advertiser. National Weather Service requires two people to send alerts. KHON2. Social service workers, government workers and community volunteers fanned out across the islands Monday night for the first night of a census that will measure whether Hawaii is making progress in its efforts to reduce the country’s highest per capita rate of homelessness. Star-Advertiser. Awkward And Rewarding Task Of Surveying Homeless Begins. Volunteers around the islands ask personal questions of homeless people for the annual point-in-time count. Civil Beat. An effort to document every homeless person in the state underway. Hawaii News Now. Why Hawaii’s Unlicensed Elder Care Industry Is Out Of Control. Lawmakers have introduced a bill with the backing of the industry and some elderly-rights groups but the measure faces a long road to passage. Civil Beat. Lawmaker says there's a rise in unlicensed care homes and calls it a "major health concern". KITV. As government shutdown ends, Hawaii parks reopen. Hawaii News Now. Thousands of federal workers in Hawaii are expected to be back on the job today after a short-term federal spending bill was approved by Congress and signed into law by President Donald Trump on Monday night. Star-Advertiser. State unemployment hits all-time low of 2%. Star-Advertiser. Hawaii was briefly under a tsunami watch early this morning following a magnitude 7.9 earthquake off Alaska late Monday. Star-Advertiser. The Pacific Tsunami Warning Center has cancelled the tsunami watch for Hawaii following 7.9 magnitude earthquake off Alaska. Hawaii Public Radio. Economics of Home Solar Batteries: Affordable For Now. Hawaii Public Radio. Group of homeless providers take a stand: It's time to re-think 'compassionate disruption. Hawaii News Now. Oahu residents will see their electrical bills jump $2.44 this month primarily due to higher fuel costs. Hawaiian Electric Co. said Monday that the typical bill in January for an Oahu household using 500 kilowatt-hours of electricity is $144.26, up from $141.82 in December. Star-Advertiser. Kapolei data center expands capacity by 70%. AlohaNAP's data facility is expanding its capacity by 70 percent, a move driven by demand from local businesses and international content providers, the Kapolei data center facility said on Monday. Pacific Business News. ‘Peter Boy’ act passes first reading. A bill introduced by two Hawaii Island state senators that would repeal the 10-year statute of limitations on all manslaughter cases except for vehicular manslaughter passed its first reading by the full senate Monday. Tribune-Herald. DOH hits Sheraton with notice, $20,000 fine. The operator of a new eatery at Sheraton Kona and spa is facing a hefty fine for operating without a valid state Department of Health permit. West Hawaii Today. Hawaii lawmakers introduce bill to keep Maui apartment complex affordable. Hawaii lawmakers on Monday introduced legislation that directs the state housing finance agency to acquire a 142-unit apartment complex on Maui in an effort to keep rents there affordable for low-income tenants at the Front Street Apartments in Lahaina. Pacific Business News. A trial is set to begin Wednesday for one of six protesters arrested last year while trying to block a large vehicle convoy carrying equipment to the summit of Haleakala. Maui News. Maui County begins nearly $2M project to repair Piilani Highway. Hawaii News Now. DOT: Bypass realignment can be tweaked but cannot be stopped. Changes planned for the north end of the bypass at Keawe Street have run into plenty of opposition. Maui News. Landslide Repair Work Begins at Nuanualoa Gulch. Maui Now. Sunrise viewing, park operations back after spending bill passes. Maui News. Event organizers today estimated number of people who turned out for the Women’s March Maui 2018 at somewhere between 3,500 to 5000 individuals. Maui Now. Another helicopter company to start flying. Maverick Helicopters is adding its own choppers to Kauai skies sometime in early summer of 2018, to the disgruntlement of some residents. Garden Island.